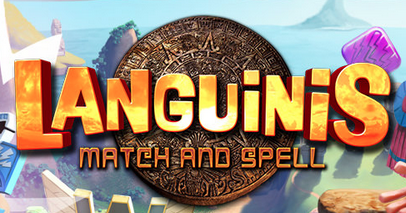 Languinis Match and Spell is a free to play mobile game (with in-game purchases) that is really annoying on the front end, but ultimately is a nice mobile game to occupy your time in between things. 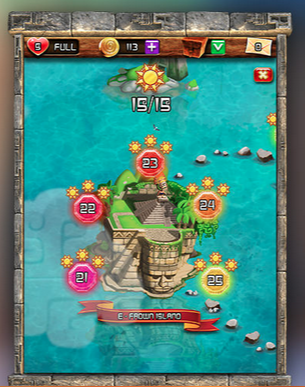 The game plays very much like your typical “matching” tiles/objects/icons games, and immediately felt reminiscent of Treasures of Montezuma Blitz on the PSVita. Story: The Languinis were assigned to provide the names to all the things of the world, and at one point could no longer remember all the names, became lazy and stopped doing it. 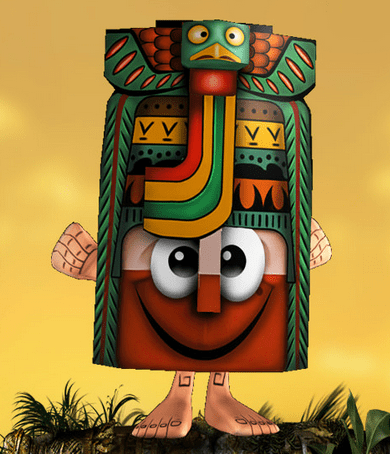 The god who tasked them with this objective is furious, and you’ve got to help them. Match the icons to reveal letters, and use the letters to spell words. There are a variety of Languinis and you need to help save them all! Gameplay: Much as you’d expect, it sort of follows your generic tile-matching game. The difference here is that the matched tiles reveal letters, and those are the letters you use to spell the words. 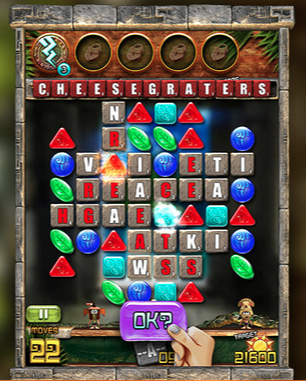 Each level has goals, usually either removing a certain amount of a particular tile, points via tile removal and spelling words, or a combination of both. The annoying part? The first 5-10 levels are all filled with the “forced tutorial” nonsense where everything pops up with arrows to click at and you CAN’T progress without tapping on the things they want you to tap. I get that it is designed to teach you the various tools and items you have in-game, but after several levels I got the gist of it and was ready to play on my own without being halted by these prompts. There isn’t a way to skip them that I’d found, so just be prepared to go through that for your first expedition into the game. Once you’re past that, you get to truly enjoy the game. Level design is essentially the same throughout. The tiles fall from the top, you swipe to match at least 3 together, and they reveal letters. No major art style changes in the 30-some levels I ventured through though. Some levels have bonus goals that yield extra points but you have to remember that this is a free-to-play game. You only get a certain amount of hearts per day (i.e. plays) to attempt each level. Didn’t successfully complete the level? No problem, just use the coins you’ve earned throughout to get additional moves per game. Out of coins? Well, you can purchase them for real money but I think the game provides enough entertainment without shelling out a few bucks here and there. 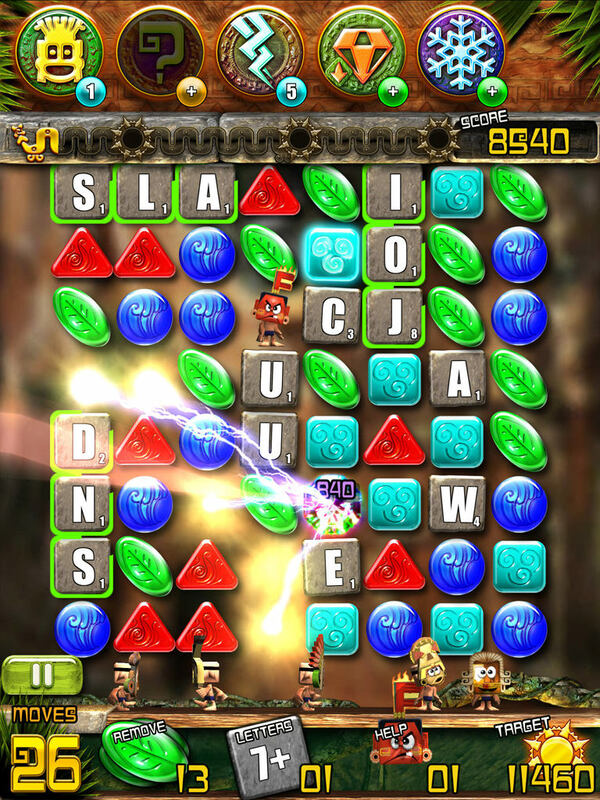 The game does have an extensive amount of levels, each with increasingly difficult challenges. Because each level is based on a total amount of moves you have to complete the objectives, it really puts a brain strain on to make sure you’re spelling words efficiently. Don’t spell “bee” just because you can, but maybe spell “breaking” instead of just “break” or “beak.” Thankfully there are in-game items you can use to help you out. Destroy an entire line of tiles/letters, auto-spell the best word on the board (this one seems pretty cheesy, but is great if you need to hit a max points goal with minimal moves used), and a few others. Same general free-to-play model; earn some throughout levels, but also available to buy a pack of them for a small fee. Verdict: Ultimately this game provides good entertainment for enough time without having to shell out money. If you really get into the game and want to keep playing after you’ve exhausted the daily limit, you might have to shell out some cash. There are also ways to get free-plays via facebook connections (similar to Candy Crush), but I tend to stray away from that type of system. It’s free-to-play, so you’ve got nothing to lose except some time if you want to check it out, and given how similar it feels to Treasures of Montezuma Blitz on the PS Vita (a game I loved) it’s nice to be able to play this on the go, since I always have my phone, but not necessarily my Vita. Available on Google Play and iOS, you should give it a try if you want to play a game that also will help with visualizing letters and spelling words on the go. Not a doctor, but I imagine repeated use of this game would help bolster your vocabulary. Give it a shot!